My boys loved this book! We read it out loud together for homeschool last Halloween (yeah, somehow I missed posting it on here) and they complained every time we had to stop. Our final day we just kept reading, covering the last 30% of the book all at once. This is not literary fiction, so don’t expect it. But it is easy to read and very, very fun. It’s a plot-driven adventure that will keep 8- to 12-year-olds sprinting through the pages. Included within them are a freaky old manor with hidden passages and bricked-up rooms, an even freakier graveyard, riddles, an eccentric aunt who drives a pink hearse, a talking rat, and a 300-year-old pirate mystery. Oh yeah, and monsters. Lots of them. It’s a Halloween story, after all. And it’s a kid-pleaser. It was also a mom-pleaser. While scary and silly aren’t my person favorites, I AM NOT A TWEEN. In this case, I was more concerned about the story diving into spiritual or gory content. It did neither. The zombie was a little gross, but it wasn’t disturbing. And witchcraft, happily, was simply not included in the story. Kudos to the authors on both accounts! It was also very readable–engaging, fluid, and well-paced. In conclusion, this is a perfect Halloween story if you want suspense, monsters, and fun minus the negatives that come with the holiday. Based on this and my boys’ overwhelming enthusiasm, I rate it 5 stars. A wonderful read for tween boys. 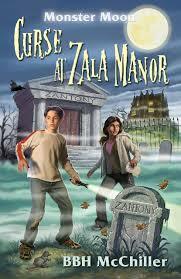 Grab a Kindle copy of Zala Manor for just 1.99! The authors have created a free AR-type (Accelerated Reading program) downloadable quiz. The cover reminded me of one of the old Hardy Boy’s books. Thanks for your honest review and with the way time flies, Halloween will be here soon. I’ll be sure to read this one before that happens. Oh, you’re right! It does have that Hardy Boys feel. Yes, I thought the same thing — Hardy Boys — when I saw the cover. This does sound like a tween pleaser. A pink hearse and zombies. I imagine it’s fun seeing books through your son’s eyes. Also helps you as a an author. I loved hearing about this book through your boys’ eyes. I also appreciated that you gave us a heads-up about the content. I have tween boys, too, but neither are too into gory things. Thanks for a great review! I actually love Halloween-y books! I’ll might check this out for when I want something fun and creepy. Thanks for the comment, Reader Noir. Sorry it took me so long to reply. I left on vacation right after this posted. What an awesome review! And you added the quiz, too! You rock! Thanks a million, Michelle! No problem, Lynn. These were both fun reads. It’s always great to get a look at what kids really enjoy for these MMGM! Thanks! Thanks, Andrea. I liked finding new books for my kids on MMGM. Erik, you’re a bit advanced for these books, I’ll admit. But for younger, lower readers, they’re great.